AMRITAPURI, India — The droves who come here leave with no souvenirs, no memories of posh hotels, nothing more than they brought. All they came for was a hug. The woman offering the soft embrace is considered a guru, and her tender approach and simple message have galvanized followers to amass in crowds thousands deep at stops around the globe. Part of the appeal of Mata Amritanandamayi, or Amma, as she is universally known, are teachings she says transcend any single faith, let alone simply her Hindu upbringing. The masses aren’t coming for Amma’s eloquence, though. Far more than any oratory, any dogma, any writings, people are drawn here by her touch, and so they line up and wait in marathon hugging sessions that can stretch 20 hours and more. The guru’s aides say she sleeps little, sometimes just an hour a night, but is as eager to hug her first visitor as her last. Here, on these lush banks of the Arabian Sea near India’s southern tip, along backwaters dotted with coconut and cashew trees, Amma has built the capital of hugs. Her ashram, or spiritual center, is a maze of buildings reached by boat or a footbridge over a river. Eventually, visitors find a large open-air auditorium with a group of men playing music and chanting, and lines of plastic chairs full of people awaiting their turn to walk up the ramp at stage right. When they finally make it, they enter a space so full of people it is hard to move. Amma is finally in sight. She is wrapped in a sheer white sari. Her dark hair is tinged with gray and pulled back, her face round, her features soft. Her ears and nose are pierced, and a red and gold dot is worn between her eyebrows. Her smile is beaming but imperfect. She looks older than her 55 years. She offers hugs as aides come to her with varied questions about her multimillion-dollar charity network of hospitals and orphanages; she gesticulates frequently as she talks. 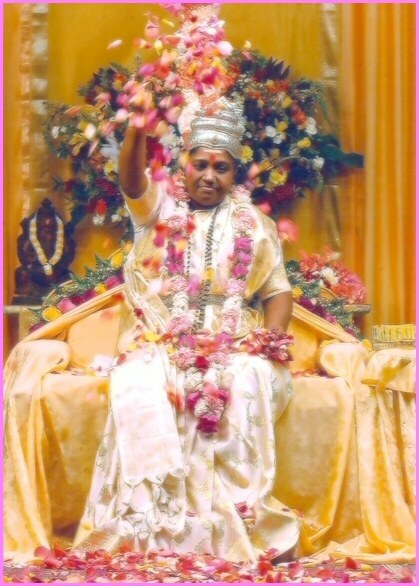 When the time comes, the visitor is nudged to sink to his knees before Amma’s makeshift throne covered in gold fabric. And, in an instant, it happens. She holds the visitor’s head tightly between her shoulder and face, uttering in Malayalam what is unintelligible to the non-speaker. Some, she simply holds, others she gently strokes or pats their backs. Some are brief encounters; others last several minutes. Some sob. Others can’t help but to break into a gaping smile of their own. Some tremble, believing they have been given a divine touch. Nearly everyone seems moved. When it is over, Amma offers her visitor a small gift — often a hard candy or piece of fruit — and the line moves on. All told, her aides claim she has done this more than 25 million times. The experience so moves some that they give up their lives to follow the guru. Dante Sawyer was editing a jazz magazine in New York when he first met Amma in 1998. He had never felt anything like it. Two years after first meeting Amma — a name that means mother in Malayalam — he moved here to dedicate his life to her work. Countless others have similar stories to tell. Amma was named Sudhamani when born to a relatively poor family here and from childhood was said to have spent a great deal of time meditating, singing and chanting, fixing her eyes on a picture of Krishna. As her followers tell it, she felt compassion for others from an early age, even to untouchables, and was driven to tears by others’ suffering. Her own family viewed her with disdain, even wondering if she was mentally ill, those who tell her story say, and she was beaten and treated as a servant. She even pondered suicide. All sorts of lore surrounds her story, including miraculous claims of turning water to milk and allowing a poisonous cobra to flick its tongue against her own. However it happened, though, as a young woman she attracted a following. Some ridiculed her and deemed her a fraud, but the number of devotees grew, and people began to journey to her in the 1970s. She became regarded as a guru, but unlike other Hindu spiritual masters, she allowed herself to be more than just seen, offering her touch to anyone who wanted it. 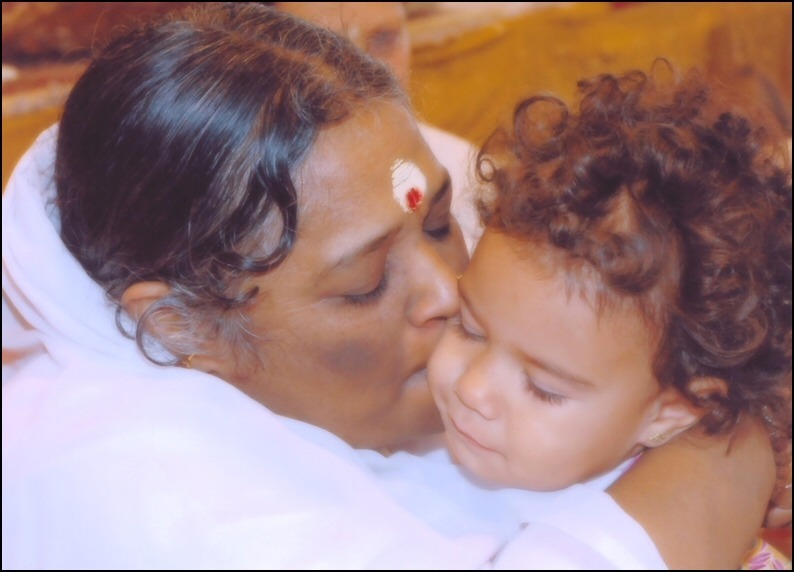 Amma’s touch is seen as having the potential to ignite one’s spiritual power. Critics remain, charging Amma’s movement amounts to a personality cult. They question the finances of her organization or even claim it is linked to radical groups. Amma and her followers reject such accusations. 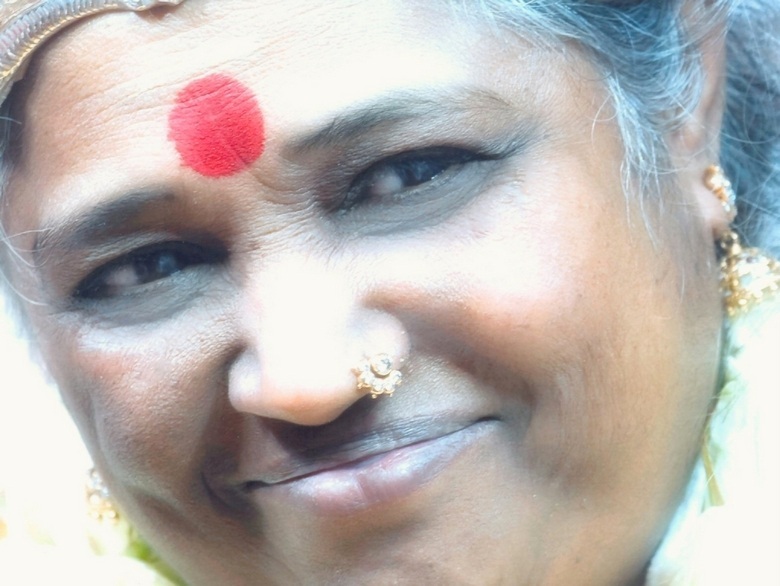 Swami Amritaswarupananda Puri, considered Amma’s most senior disciple, says the guru has attracted so many followers because she is accessible to anyone and allows people to feel the presence of God. Today, her spiritual star power drives not only her popularity, but the success of international humanitarian efforts fueled by millions in donations. A visitor to her ashram is not asked to give anything, but many around the world do, funding her many Indian charitable endeavors, as well as massive relief for those affected by events such as the Asian tsunami. She has a sleek Web site. Her movements are tracked on Twitter. She even has a logo. At the end of her exceptionally long days, Amma climbs the steps to a simple studio apartment in a small peach-colored walk-up at the ashram. She will go to bed alone, having refuted her parents’ numerous attempts to arrange a marriage. 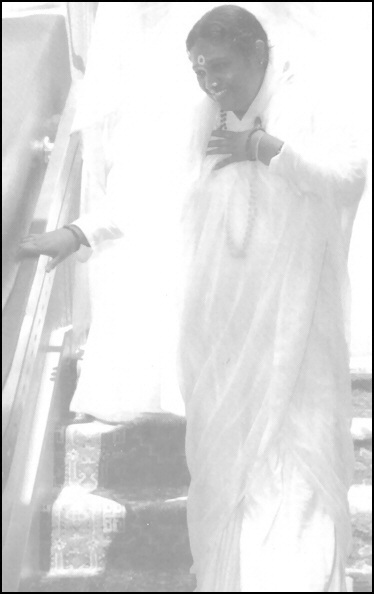 Amma received no formal education beyond the age of 10, and on this day, like every other, she has steered away from scriptural specifics. But her message is clear. It is about taking as little as possible and giving the maximum, about embracing the core of faith. It is, in essence, about a hug.